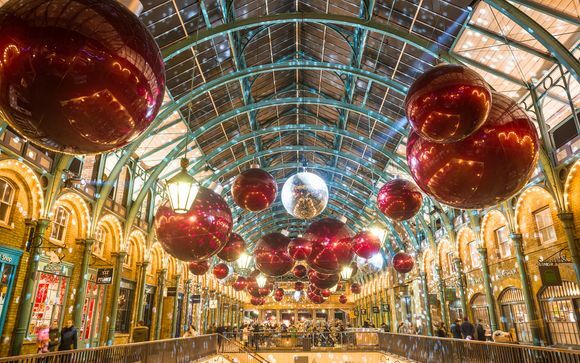 Enjoy a stay in one of London's newest hotels, the InterContinental London The O2 - this exclusive property has great connections to all of London's sights and attractions and is a great place for a city break. You'll enjoy a complimentary upgrade to a Deluxe Room with views out over the city and a range of modern features. The hotel's dining options are plentiful and incredible, be sure to visit the astounding Sky Bar! InterContinental London The O2 is a new luxury hotel located in historic Royal Greenwich on the vibrant Greenwich Peninsula. 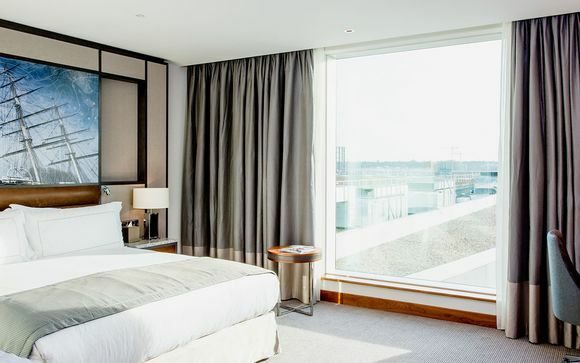 Situated only 400m from North Greenwich Tube Station on the Jubilee Line and only a 5 minute walk from Greenwich Pier, the Intercontinental is perfectly connected to London’s West End and its many sights. 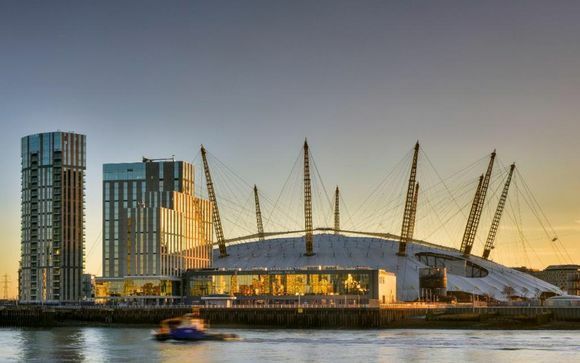 The O2, the world’s most popular music and entertainment venue is 350 yards from the hotel as well as being minutes from ExCel London on the Emirates Airline cable car. The InterContinental London - The O2 is a stunning new hotel that is ideal for a modern city break in London. The hotel features 453 spacious guest rooms and suites spread over 18 floors, and you'll receive a complimentary upgrade to a Deluxe Room. Restaurants and Bars have been designed as destination venues, with an impressive line up of all day dining and fine dining options, as well as a main bar and Tea Salon to perfectly complement the Sky Bar within its mix of vibrant and relaxing entertainment spaces. Please note: this offer is non-refundable and non-amendable. This offer is based on an upgrade to a Deluxe Room. There is also the option to upgrade to a Deluxe Room With a View or a Suite at the next stage of the booking process. Step into your fabulous Deluxe Room. With fantastic views of historic Greenwich, the O2 Arena, beautiful River Thames or Canary Wharf; this room allows you to relax in style. Ranging in size from 29 to 32sqm. The rooms feature free wifi and modern technology, such as a 42” smart TV. The beautifully appointed granite bathrooms boast a separate bath & walk in shower with luxury amenities. Meridian Lounge is located in the hotel's lobby, offers ample space for relaxing, working and meeting including a spacious outdoor area. Settle down with homemade patisserie, fine tees and speciality coffees laced with oriental spices, bringing the Greenwich Peninsula trading history right to the hotel. The lively brasserie boasts floor-to-ceiling windows and an open plan kitchen, with fresh breads and pastries made daily, impressive displays of British cured meats and sides of smoked salmon. During dinner, guests can choose from a selection of regionally sourced meat and fish from the British Isles at their table and have their choice cut of meat or fillet of fish cooked to their liking in front of them in the theatre kitchen. The Peninsula Restaurant, an understated fine dining restaurant providing dramatic views over Canary Wharf and Greenwich Peninsula, this stunning dining room adopts its name and heritage from its location. Serving modern European cuisine deftly infused with a hint of exotic spice. 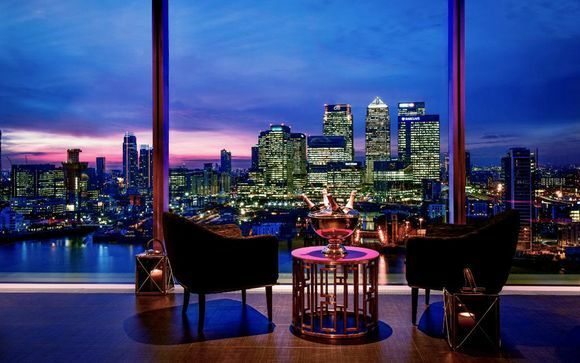 An iconic style bar with unrivalled views over the O2, Canary Wharf, Thames Barrier and Docklands. Glamorous and sophisticated with a cutting edge cocktail list and expert staff delivering a truly first class experience. Clipper Bar is a unique space in London with 270 Degree Vista windows, which truly capture the amazing views of River Thames and Canary Wharf. By day an elegant and refined Tea Salon celebrating the best of British High Tea. In the evening a sophisticated and relaxing retreat where guests can meet and unwind at the end of a busy day with our Tea spiked cocktails or a very house made Gin & Tonic. Set in the heart of the Intercontinental London – The O2, The Spa offers tranquillity and relaxation from the moment you step though the door. The Spa’s aesthetic, in keeping with the iconic style of the InterContinental brand, draws on the hotel’s location within historic Royal Greenwich and local influences of the East India Trading Company, with bespoke printed mosaic tiles, sumptuous rugs and delicate die-cut pendant lighting inspired by the area’s trading of porcelain and silks as far back as the 18th century. Please note that this offer is non-refundable.